If you haven't read the first Hormel letter yet you should look at that before reading this one. 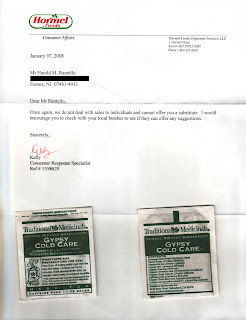 I already had a response from Hormel I was happy with so I was playing with the Houses money. Figured cranking the insanity up a notch couldn't hurt. Kelly is even more abrupt this time. She seems annoyed. And she returned the tea (and the $10). I wonder if I should write her again. She didn't really tell me the first time that they don't deal directly with consumers. Why would Kelly lie? 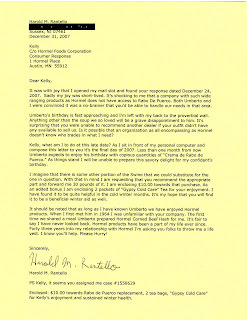 A Third Hormel letter can be found here.